It was a long week at work and I was exhausted, so I was slow moving yesterday morning. In the afternoon, however, D. and I headed out for a Gorge exploration in my new vehicle. We ended up hitting on a Gorge tick list of sorts, starting with the short hike to Bridalveil Falls, and ending in Hood River for a pint on a patio. We had our son’s new dog, which kept things interesting but fun. There were lots of clouds on the west end of the gorge, and we walked in the rain a bit at Bridalveil Falls, but we saw sunshine as we neared Hood River. At Starvation Creek Falls and Mitchell Point it seemed especially bright. It was a good afternoon and evening, reminding me how much I have to be thankful for. I am a lucky man, indeed. After picking Denise up at the Portland airport late Friday night, I pointed our van east toward towards the shadows of the Columbia Gorge. We had a vague plan to camp in the van with our dogs and ended up finding an empty spot at Ainsworth State Park. Early Saturday, after a brief slumber, in earshot of trains, we packed up, semi-prepared to do some hiking in the green depths of the Gorge. 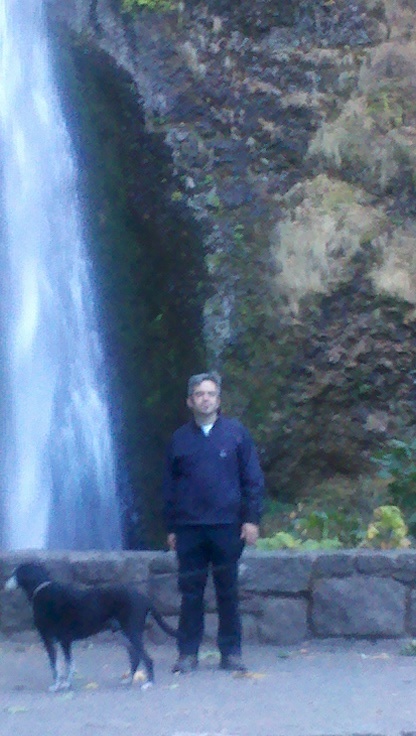 Our first stop in the cool morning was one of the classic cascades along the old scenic highway, Horsetail Falls. It plunges 192 feet into a lovely pool just a few yards from the road. When we first arrived, there were a few other people there. Just east of the falls, a trail system takes off uphill with possible loops connecting to Larch Mountain and Multnomah Falls. 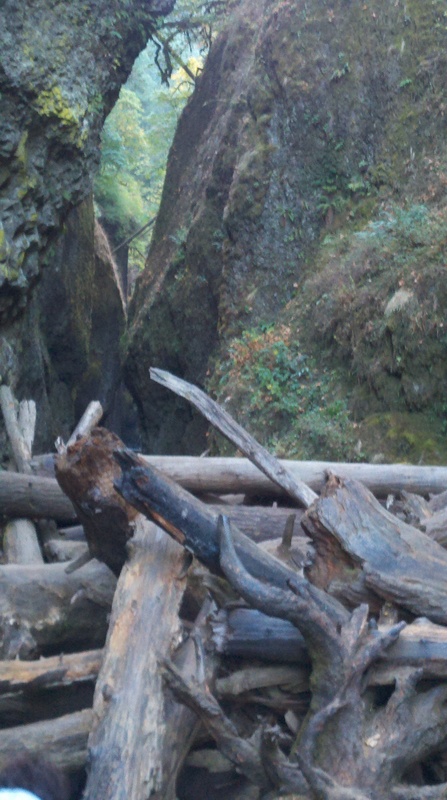 Our sights were set on another spot, however, so we took a quick, inadequate snapshot, and with dogs on leash, headed west to the mouth of Oneonta Gorge. The lush locale was featured in the October edition of Condé Nast Traveler magazine, complete with characters found only in Portland: a handsome bearded man in kilt and a woman in furry vest and skirts worthy of a Seurat painting. 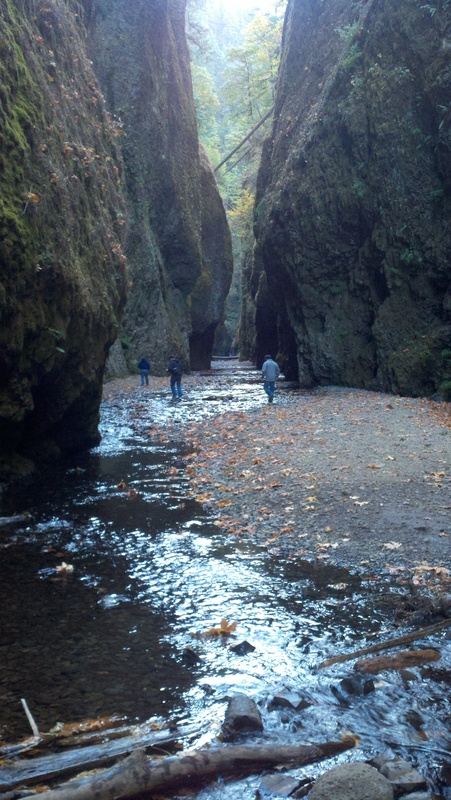 Oneonta Gorge does not have an official trail, but that did not deter scramblers interested in its narrow confines. Slot canyons are rare in Oregon, so a mossy basalt-cliff-lined gorge visible from the old highway is a real attraction. We scrambled into the canyon and across a shallow creek. A tall logjam loomed before us in a hundred yards, the walls of the canyon now only fifty or sixty feet wide. Moss, fern, and lichen covered basalt cliffs soar vertically from the streambed. There is no place for escape in a flash flood. Giant pick-up sticks. The gorge narrows beyond. The dogs could not handle scrambling over the logjam, so Denise and I alternated turns exploring beyond the barrier, where the canyon narrowed even further. Although it was completely Northwest in nature, the spot reminded me of the Zion Narrows in Utah. 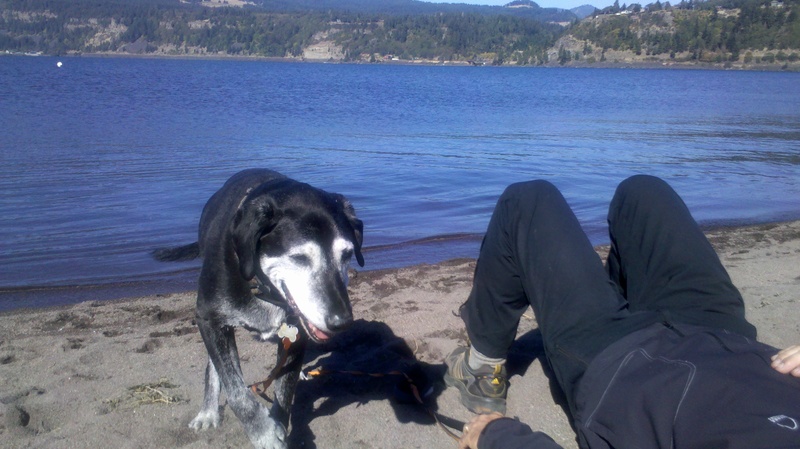 It is truly one of a kind, but without serious boots, and with our pups, we were unprepared to hike too far upstream. That would be another time, another adventure. We decided to complete the classic Mount Hood loop, so we headed to Hood River, where we went to a windsurfer beach and soaked up the wonderful October sun. I actually briefly dozed while the dogs explored a bit. We also watched a stand-up paddleboarder venture onto the Columbia. Later, we had a midday nosh at a café and checked out one of our favorite tiny bookstores, Artifacts. For the dogs’ sake, we wanted at least one more hike on the final leg of our journey. That brought us to the Elk Meadows/Sahalie Falls trailhead near Mount Hood Meadows. We had camped near Elk Meadows in the nineties with a couple friends. This time, we headed toward Sahalie Falls. The trail crosses near a road near Hood River Meadows, then cuts across a pleasant forested hillside towards the top of the falls. While the view is not great, it was still a pleasant diversion. The best view of all was near the road crossing, where one can see the open land at Hood River Meadows itself. 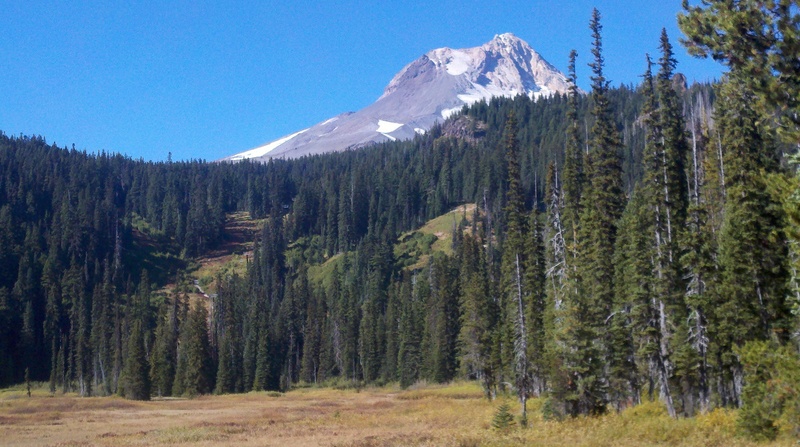 Mount Hood across Hood River Meadows. Snow? Who needs snow? The slopes beyond hint at the skiing that could start in five weeks or so. That seemed hard to fathom as the sun warmed us on the way back to the van. Sometimes small jaunts add up to a greater adventure. We headed home happy, glad to have shared such a trip together on a perfect day in the Northwest.